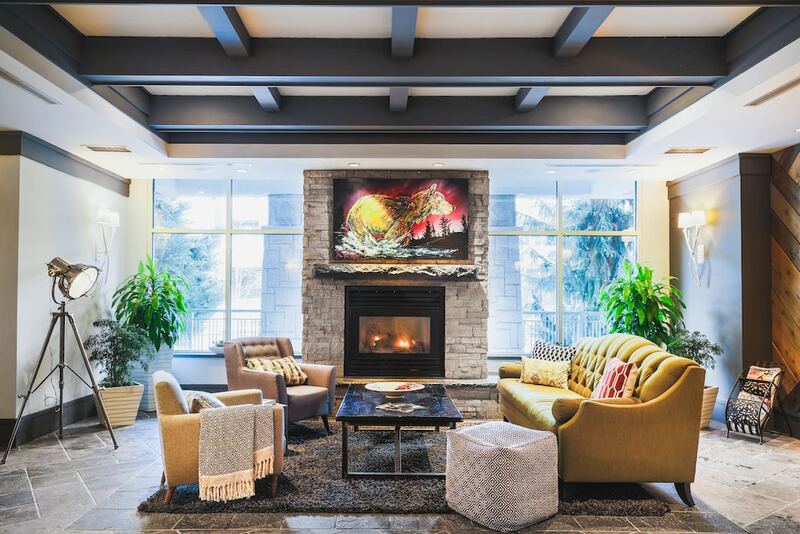 This hotel is adjacent to Whistler Village Market with complimentary ski shuttle service and skit valet, and in-house ski-tuning shop. Shopping and dining are just steps away. Guests at Summit Lodge Boutique Hotel enjoy a complimentary cruiser bikes, ski shuttle to nearby runs, treatments at the Taman Sari Royal Heritage Spa, and an outdoor heated pool and hot tub encircled by evergreens. Summit Lodge Boutique Hotel suites feature bathrobes to kitchenettes, fireplaces, in-room iPad Minis connected to the complimentary WiFi, Keurig coffee makers, and private balconies. The 4-story Summit Lodge Boutique Hotel has a sauna and an outdoor pool deck with a hot tub and pool that are both open year-round. Multiple ski runs and lifts are located nearby offering Alpine skiing and snow tubing. An on-site ski rental shop and complimentary ski shuttle are available to guests. The on-site spa, Taman Sari Royal Heritage Spa, offers spa treatments that include massages, facial and body treatments, hydrotherapy, and manicures and pedicures. Other amenities include 80 square meters (861 square feet) of conference space, and close to area shopping. The property offers wireless Internet access. The on-site restaurants: the Elements Urban Tapas Lounge is open for all meals and serves cocktails and Sachi Sushi serves lunch and dinner and is a sushi bar. Guests can also grill-out on the property's barbecues and enjoy the private picnic area and garden. This hotel offers complimentary WiFi services throughout the property. Limited parking on site (surcharge). Elements Urban Tapas Lounge - Serves all meals as well as cocktails. Bar open until late evening. Sachi Sushi - Sushi bar that serves lunch and dinner. Summit Lodge Boutique Hotel has a sauna as well as an outdoor hot tub and pool both open year-round. Located in Whistler Village North, the vacation home is five blocks from ski lifts serving both Whistler and Blackcomb mountains and accessible to multiple other runs/lifts in the area. There are several golf courses in the area, including the Arnold Palmer-designed Whistler Golf Course and the Chateau Whistler Golf Club, designed by Robert Trent Jones, Jr. The recreational activities listed below are available either on-site or near the vacation home; fees may apply. The Taman Sari Royal Heritage Spa is located by the pool and patio and offers spa treatments that include massages, facial and body treatments, hydrotherapy, and manicures and pedicures. The spa combines traditional Royal Javanese methods with selected organic ingredients for an “East meets West” selection of spa treatments. Selections include Asian, Javanese, and royal massages; reflexology, facial treatments, and body scrubs. An exclusive couple's suite with hydrotherapy tub is among the five treatment rooms. Other features include a Vichy shower and a foot spa. Only registered guests are allowed in the guestrooms. Guests can arrange to bring pets by contacting the property directly, using the contact information on the booking confirmation. Parking height restrictions apply.